On this day three years ago, LucasFilm announced their "new direction for LucasFilm animation" and cancelled Star Wars: The Clone Wars. Their announcement stated that "LucasFilm has decided to pursue a new direction in animated programming," that "we feel the time has come to wind down the series," and that "fans can soon find this bonus content." Two years ago on March 7, 2014, the "bonus content" was released on Netflix as "The Lost Missions." These 13 episodes featured some of the best episodes of the series, and showed how the quality of the animation and storytelling continued to improve as the series went along. Over the past two years via The Clone Wars Legacy, LucasFilm has released twenty more episodes in various formats. Eight episodes have been released as story reels, via StarWars.com. Four episodes were adapted into the comic mini-series "Star Wars: Darth Maul: Son of Dathomir." Eight episodes were adapted into the novel "Star Wars: Dark Disciple." There are still dozens of stoires that remain untold. See the recent post "Approximately 36 Clone Wars Stories Remain Untold" for more details. Continue to let Disney and LucasFilm know that there is an interest and a demand for these stories! Watch the series on Netflix or buy DVDs and Blurays. Send your letters, emails, tweets and comments to Disney and LucasFilm. Thanks again to Jimmy Mac for being the first to sound the alarm. 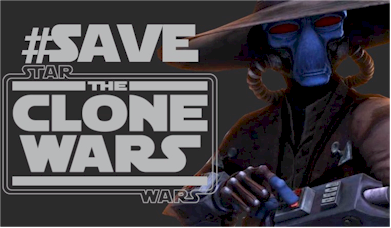 Thanks to Rebel Force Radio, Jimmy Mac and Jason Swank, for the episode, "RebelForce Radio: Special Report - Save The Clone Wars" that was released on this day three years ago. I would do anything to get the clone wars back, rebels is just not the same quality. Yeah. Rebels is an embarrassment that highlights the mistake that was brought upon by the 'team' of Disney and Lucasfilm. Sure, the Force Awakens was a success, but it wasn't recognized as a Disney film. Disney wasn't even in the opening credits of the movie nor on the DVD box. 20th Century Fox made it known that they owned Lucasfilm because they didn't have a reputation for making animated kids movies. Disney clearly wants to hide the fact that they own Lucasfilm to make people more willing to watch the Force Awakens, even though everybody knows. Back to Clone Wars, I share your desire to return the series. If not on TV, at least make it available on Netflix. It's obvious they still have stories to tell. After Rebels finishes, could they please wrap it up? SO MUCH WAS LEFT UNANSWERED!!! Yeah I want to know if echo survived. I also want to see the episode where admiral Trench supposedly captures him. Honestly, with lucasfilms being bought by disney, I think that disney went "Cancel the clone wars becuase its too dark and violent for little kids, and because its not to our taste or brand label no one should enjoy it". Take a look at rebels, compare the body count and the battles to the clone wars and see. Rebels is really embarrassing, just like episode VII which is just a dumbed down version of episode IV with the worst villain ever been brought on screen. Couldn't be more disappointed than what's Disney is doing with the star wars franchise for a while now. Let's hope that rogue 1 will be good. The Clone Wars is what got me into the Star Wars universe. To see it end breaks my heart. Really hope they reboot the series. The Clone Wars is a really good place to start a new plot for future movies and etc. Disney is missing out on a huge opportunity. Why did you kill darth maul in rebels? I was excited to see him in star wars episode 8. Please bring him back.